Boring? Maybe. But the future of your business may be at stake. Questions as to whether to rent or buy your store space/workshop outright are important decisions. Without a bit of guidance about what you can expect from the property market you could find yourself in a lot of strife, even bankrupt. Dent is notorious for being bearish, but he has picked at least of the boom-bust cycles well...but not all. Still...don't take his word for gospel. A critical contrarian view of Dent can be found here. He actually overstates his successes in picking boom-bust cycles. Just in case that made you yawn, let me tell you that Dent thinks that if you thought the GFC had a dreadful impact on your business bottom line then there may be worse to come. The China bubble is about to pop. There will be more Eurozone related troubles. Controversially, he argues there will be a world-wide Great Depression in the wake of these post-bubble busts. Clothing, especially menswear, is a very business climate sensitive area of commerce. So pay attention. On the positive side, downturns in business confidence discourage businesspeople from going to work in a polo shirt. It means that if you want to seal the deal, keep a job, or regain employment, you have to look the part. Both men and women. It's not for nothing that the era of the Great Depression is also an era of some elegance when it came to business and formal dress. When the going gets tough you can't afford to show up to work in 1990s attire. Once again....you may be thinking "so what"! Some countries like Ireland, Spain and the US had their real estate bubbles popped during the GFC. But other countries managed to have a bit of air let out their bubble, which went on to grow even bigger. It is looking like these countries are ready to have their bubbles popped by the next economic downturn (probably by the popping of the China bubble). Is your country on the bubble trouble curve? If so, and you have a mortgage on your shop (or home), trouble is likely to be afoot. The danger is that you could end up with an upside down mortgage where your property is worth less than your mortgage. As monstrous housing bubbles deflated in countries like Ireland and the U.S., other residential property markets surged or only partly corrected. We survey a series of measures (including house prices, ratios to income and rents, debt and debt service) to assess where markets are already (or still) so overpriced that, in any reasonable scenario, a major correction is in store. 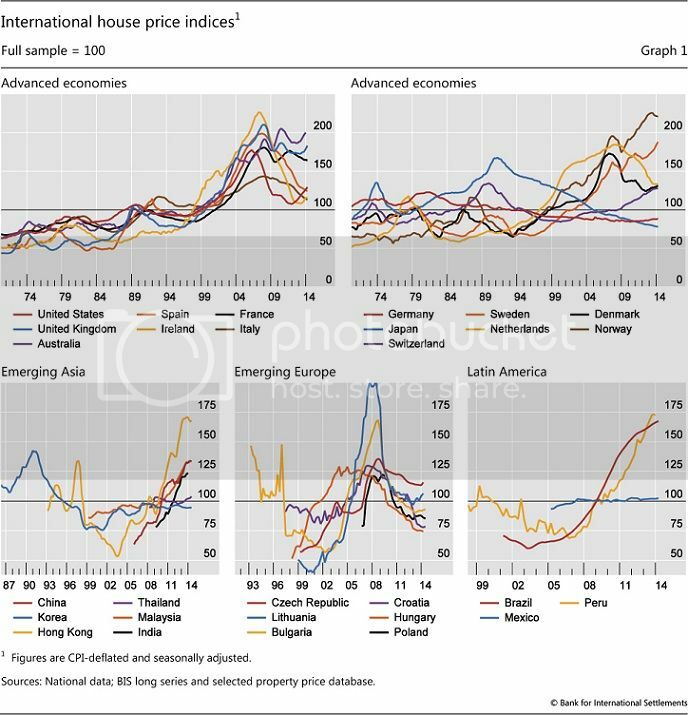 Bottom line: Home prices look extremely elevated in Norway, France, Canada, the UK, Sweden and Australia; in emerging markets (EMs), only Hong Kong stands out, but Turkey’s and China’s markets are ripe for a downturn and Brazil shows cause for concern, for reasons we explain in detail. In developed markets (DMs), debt service at historical lows and rising incomes mean a catalyst for correction will await rate hikes or recession. Unlike 2005-07, “supply myopia” [ie, blaming a housing shortage for high prices] is unlikely right now, although Norway, Canada and Switzerland are still overbuilding. Roubini fully predicted the subprime mortgage crisis and all its repercussions. They though he was crazy and dismissed him until everything he said came to fruition. Ignore him at your peril. Now they call him Dr Doom. The China real estate bubble has already popped. The ripples will flow through to the international market soon....the economic winter is coming. Yowser, that's very scary stuff indeed. All the more reason for tailors to get good at marketing themselves. Yes, yes, I know. "Marketing is dirty. Sales are evil. Word of mouth is all you need. Your quality sells itself." Just a question: How's that working out for you? Not being snide here: We all know how hard it can be to find good customers and keep them. The moment you launch a new website, a competitor with a big advertising budget is there to push you down in the Google results. The one thing to NOT do is to compete on price - especially with something like bespoke clothing. It's a race to the bottom. People who truly value quality clothing and who can afford it will sooner be put off by price deals than be attracted by it. Sator raises an interesting topic. I heard it said some 6 or 7 years ago that the Chinese were intentionally manipulating their currency on the exchange, so talk of a collapsing China bubble is no surprise to me. Actually, I think the recent Alibaba IPO is the crest of China's wave. Roubini is likely correct; breakers incoming. And China has what percentage of the world's population? Scary times a'comin indeed. Now, I'm no market analyst, but as someone who just lived through the US economic collapse and has heard all of the doom and gloom before, I feel I must temper the panic with sanity. You MUST understand the mechanics of an economic collapse if you expect to survive it. ANY housing bubble is driven by real estate investors, not the domestically-minded home owner. The US housing bubble actually only involved a small percentage of American cities which were overinflated by greedy real estate developers who ignored the laws of supply and demand. They built more homes than there were people who could afford them. The banks wanted their share of the action and resorted to sub-prime lending. When our economy slowed down (a natural occurrence unrelated to the impending housing crisis) and corporate profits caused businesses to lay off part or all of their employees, borrowers could no longer afford their overpriced homes. They wanted to sell quickly to avoid bankruptcy, so sold for less than they paid. More borrowers became sub-prime borrowers and eventually were forced into bankruptcy at pretty much the same time. At this point the housing crisis became the evening news. That caused a panic to sell off in markets that weren't even involved in the bubble, which caused an artificial loss of equity in some markets. There were of course other factors that affected our economy as a whole and to cover it all would fill a book or three; I'm speaking only of that small aspect that is considered to be a leading indicator as opposed to a trailing indicator. My personal experience: Hubby and I bought a home before the collapse. We bought it to be our final home, not an investment. We were and still are happy in it. It has not been a cause of negative cash flow for us, even though we still owe on it. Our area is not a hotspot of investment activity and most people around here believe home prices and home values are reasonably in line with each other. During the recession, we ended up underwater but we did not sell. Now, we have more equity than we did before the recession. By contrast, my former neighbor sold out at a loss and the new neighbor has the equity. So my advice. If you bought property to rent out or fix-and-flip, then of course, by all means you should reconsider your position. The same goes for stocks and other growth/dividend-income investment tools. If you hang on to these investments, you may never see the return you had hoped for. HOWEVER, if you bought real estate primarily to live and/or work there, if you're happy there and had no intention of selling before the crisis began, and if it isn't creating a negative cash flow, you must think differently. Yes, you may owe more than it's worth, but selling off or declaring bankruptcy based on emotion only adds to the statistics, adds to the panic, causes the hive mind to continue selling unnecessarily, and drives the recession deeper. Now for some good news. Japan has suffered in recent years. Of all the Asian markets on the chart Sator posted, Japan seems to have the most room for growth, but only if poised for growth. Australia is economically tied to Asia. I'm guessing Japan might be the best regional economic harbor in terms of growth-investment strategy. Alas, I'm not in Oz, so I'll leave that discussion to Sator and other locals. Some countries (US, Ireland, Germany, and most of emerging Europe) the housing markets have recently popped and are showing signs of stability or recovery. A few other countries (Spain, Italy, Japan) have been experiencing downturns recently and will likely stabilize soon (I'm basing that SOLELY on the chart). In the US we have the beginnings of a trend towards domestic sourcing and labor (ah, the good old days). Start-ups are investing in domestic materials and a few established companies are shifting that direction. Nature abhors a vacuum, and a second round of economic crises involving markets like China (a leading export country) will create just that, a vacuum. This could be a big shot in the arm for the recently or soon-to-be stable countries where the bottom has already fallen out. Then again, I may be completely wrong. China's collapse may bring the end of the world for all of us. Thing to remember is that everything is propaganda. Everything. Me, you, they - everyone has their own perception, fears, and agenda. Problems occur when too many believe one source and start acting accordingly - bank runs result and whatever other disasters follow. I'm no expert on finances in any way (Ha! Understatement much, Martin?) but given that everything is always in motion, a downturn should always lead back to an upswing - I think. Keep calm. Prepare. Don't believe hyperbolic fear-mongering. Decide on rational reasons and be wary of manipulated emotions in the mix. Also: don't panic. Decisions based on fear are extremely dangerous because fear clouds reason. I would advise the ones who speak German to search for Alois Irlmaier and check it out critical. 2015 will be the climax of the continuation of World War II. By the most recent reckonings, the actual end of the world has happened exactly 0 times. Faith raises a number of good points. I particularly agree that if you are caught out by a recession you didn't plan for, you shouldn't panic sell just because your property goes 'underwater' (ie your mortgage is for more than the place is worth). Before a bubble burst, property is overpriced, but after the correction it tends to become undervalued ie there is an OVERCORRECTION. If you tough it out, the value of your property will gradually correct even if it takes 10 years. So don't panic sell. If you're happy where you are, just be patient. Better still is if you anticipate the downturn. You see that there is a bubble so you sell at the bubble peak. Sell high, buy low. If your country is in real estate bubble territory: sell now. Rent and wait for the overcorrection to kick in, causing property prices to deflate excessively, then buy. Use knowledge of market cycles to your advantage. Smart people did this back in 1928 when there was a stock market speculation frenzy. The definition of a bubble is when asset prices go up to a degree that is in excess of economic fundamentals. In 1928, if you looked at the productivity indices such as the number of cars being manufactured by Ford, it was all going downwards, tanking big time, but, despite this, the stock market kept going up and up. Like the dot.com bubble it was fuelled by technology: the 1920s world was becoming fully electrical, with radio, plus widespread adoption of cars, rail etc. The Chrysler Building and the Empire State were built then. Those who saw the bubble in 1928 and sold their stock before the crash of 1929 did well out of it. As for Harry Dent, he foresaw the dot.com bubble bursting. If you followed his advice to sell your Microsoft shares you'd brought up in the 1980s for virtually nothing, you'd have made a good profit. Buy low, sell high. Those who followed Nouriel Roubini's advice to sell at the peak of the subprime bubble also did well out of it by selling high. Nouriel Roubini was right. At a time when the likes of Alan Greenspan were dismissing concerns about excessive home prices and declaring that banks were stronger than ever, Roubini warned that there was a monstrous bubble in the housing market and that the bursting of that bubble would cause much of the financial system to collapse. And so it has turned out, with even the most seemingly outlandish of Roubini's predictions matched or even exceeded by reality. As for local vs international influences, my belief is that we live in a global age. In fact, analysts in the 1930s already saw that the stock market of the Great Depression was influenced by global forces. So OVERALL, the forces that push up property prices in a country tend to be global forces. Those during the subprime bubble who argued that US property bubble prices were just due to LOCAL supply and demand issues (and that inflated prices were actually fair market prices) rather than GLOBAL forces conspiring to blow bubbles got hurt big time. To fuel this infrastructure project, China has purchased a huge amount of raw material. This has propped up countries that are mineral resource rich, especially Canada, Chile and Australia. These nations will suffer immensely when the China driven resource boom turns to bust. Canada and Australia have BIG property bubbles which are set to pop. China can't keep importing iron ore from these countries to continue building endless ghost cities forever. If the Chinese government injects more stimulus into the property sector to build even more ghost cities, the problem with only be deferred, and the bubble will burst with an even bigger bang. When the bubble pops, a country goes through deleveraging (paying off of accumulated debts). This leads to deflation. Japan went through years of deflation crisis. The US is actually going through it now, but you don't notice it much because the Fed's response has been quantitative easing (QE), which deliberately causes inflation. When the Fed QE comes to an end this November, you may see deflation creeping in. The price of property and goods will go down according to Harry Dent's analysis. ...economists and commentators [who warned of the impending subprime crisis] were ignored, a fact that speaks volumes about the state of economics and finance over recent decades. Most people who inhabited those worlds ignored those warnings because they clung to a simple, quaint belief: that markets are self-regulating entities that are stable, solid, and dependable. By this reasoning, the entire edifice of twenty-first-century capitalism—aided, of course, by newfangled financial innovation—would regulate itself, keeping close to a steady, self-adjusting state of equilibrium. It all seems naive in retrospect, but for decades it was the conventional wisdom, the basis of momentous policy decisions and the rationale for grand-scale investment strategies. In this paradigm, not surprisingly, economic crises had little or no significant place. Indeed, if crises appeared at all, they were freak events: highly improbable, extremely unusual, largely unpredictable, and fleeting in their consequences. To the extent that crises became the object of serious academic study, they were generally considered to afflict less developed, "troubled" countries, not economic powerhouses like the United States. In most advanced economies, the second half of the twentieth century was a period of relative, if uncharacteristic, calm, culminating in a halcyon period of low inflation and high growth that economists dubbed the "Great Moderation." As a result, mainstream economics has either ignored crises or seen them as symptoms of troubles in less developed economies. The second half of the 20th century was such a time of peace and prosperity that economists were lulled into believing fairy tales about how the economy was a beautiful and harmonious self-regulating organism. Don't interfere, they said, it runs itself perfectly. Laissez faire become the catch phrase. From the beginning, it has been fashionable to blame [the GFC] on recently issued subprime mortgages that somehow infected an otherwise healthy global financial system. This chapter challenges that absurd perspective, showing how decades-old trends and policies created a global financial system that was subprime from top to bottom. In other words, the whole global financial system may well be rotten through and through. It's far too scary to be boring. Martin, you said EXACTLY what I went the long way about saying. We should be afraid, but take a proactive and rational position. Sator, I gather you are a well read individual. And I want to clarify what I was saying earlier about localised bubbles. I wasn't denying the existence of a global economy or saying that what happens in Miami has no bearing on Athens. I only meant that property values in some cities were more inflated than in others, and people in the not-so-inflated areas panicked. What you said about the US and inflation are spot on. The grocery bill here has gone up 4-fold in the last six years. Enough comedy. I read the wikipedia AND investopedia articles on QE and I understand it even less. Oh well. Que sera, sera. It's nothing I can control. If Sator says QE leads to inflation, I'll just take his word. I still have faith (no pun intended) that the worst is over for the US economy. The concept of DEflation sounds interesting though. I wonder if we'll see half-dollar eggs again. At any rate, home-grown and home-made seem to be the next big thing. Those that can grow and make for themselves and barter with others will weather out whatever the future throws at us. Sorry, quantitative easing is a fancy term that just means printing money! The Fed has printed lots and lots and lots. The reason the wiki article might be confusing may be because nobody really understands it. 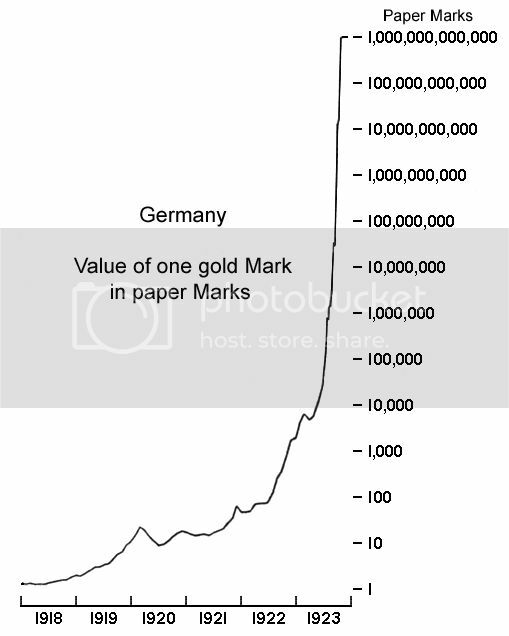 One gold pegged German mark was worth 1000 000 000 000 mark at the peak. During the worst phase, if you got paid in the morning, inflation had rendered your pay package worthless by the evening. This is hyperinflation. I remember one story where a man went to buy a loaf of bread. He had to fill his wheelbarrow full of money to go to the bakery. On the way, he got distracted by some commotion, and put down his wheelbarrow. Sadly, some thief had come along. He returned to find his wheelbarrow had been stolen but the thief had dumped the money on the ground! But if you are facing deflation, then QE can help counteract it by introducing a bit of inflation as an antidote. Deflation is just as bad. If goods cost very little it means that your margins are low, so as a seller it means you don't earn much. That means your income is reduced, so you can't afford to spend money, forcing other people to lower prices and reduce their margins. It's a vicious cycle. Deflation is what happened to Japan post-bubble pop in the 1990s. Other countries may end up trapped in the same post-bubble deflation cycle. The same deflation trap has hit post-bubble Spain as well, and there is still a risk of it hitting Ireland. Some analysts think that deflation may be coming to the US and talk about the Japanisation of the world economy. I want to clarify what I was saying earlier about localised bubbles. I wasn't denying the existence of a global economy or saying that what happens in Miami has no bearing on Athens. I only meant that property values in some cities were more inflated than in others, and people in the not-so-inflated areas panicked. What you said about the US and inflation are spot on. The grocery bill here has gone up 4-fold in the last six years. BTW I understand what you are saying. When there is a bubble you get people with vested interests who deny it exists. Analysts who warned of a US subprime bubble were often told they just didn't get the fact that local supply-demand issues were the cause of high prices ie the market sets the price and the market has to be correct. The Market is always Right. The Australian federal finance minister, Joe Hockey, said this about the Australia property market a couple of weeks ago actually. Hockey dismissed talk about a real estate bubble (even though BIS, the UN, the IMF, Harry Dent, Nouriel Roubini etc all think there is a major bubble in Australia and Canada). Hockey claimed that local factors of market supply-demand were pushing up Australian house prices and that these ignorant international analysts didn't understand that the Australian market was unique and different. Just what bubble deniers in the US were saying before the subprime bubble popped! All of this should have been discussed from 2008, since I follow this, it is to late now. The NWO will go its way and 2015 it is finished. I was not reading cutting books since 2010 only, I was reading how to gain eternal live and continue tailoring in 2016 as well. Sorry for you all, I will survive 2015. Read your Bible and you will too.